Yes, I do suggest that it may be beneficial to drink these two and another two cups of coffee w/ lots of sugar after your workout - if you are an athlete, at least. A delicious and refreshing pre-workout coffee or just plain caffeine from pre-workouts are probably on the supplement list of most of the SuppVersity readers. Whether the same is the case for a post-workout coffee, let alone caffeine tablets, though, is questionable. Just as questionable, as the common belief that you better stay away from coffee at any time after your workouts, by the way. If you look at the existing literature, the effects of post-workout caffeine ingestion are not exactly an intensely researched area. And still, the evidence does more or less strongly support the notion that a post-workout coffee could be as beneficial as its pre-workout analog - in a different area. Caffeine Resis- tance - Does It Even Exist? Initial evidence that the post-workout ingestion of caffeine may have beneficial effects on post-workout gylcogen resynthesis and thus an important part of the recovery process comes from a 2004 study by Battram et al. (2004). Back in the day, Battram assumed - just like you probably did - that the ingestion of caffeine after prolonged exercise would impede the resynthesis of proglycogen and macroglycogen carbohydrate supplementation in humans. Figure 1: Total glycogen [proglycogen (PG) macroglycogen (MG)] glycogen concentrations during 5 h of recovery in the placebo trial (A) and caffeine trial (B | Battram. 2004). As you can easily see if you compare the data in Figure 1 (A) for the placebo trial with the data in Figure 1 (B), which was generated in the trial in which the healthy young men who participated in Battram's study received a whopping dose of 6mg/kg of caffeine, there is no ill effect on post-workout gylcogen resynthesis even with high dose caffeine supplementation. "In conclusion, Caf ingestion does not impede the resynthesis of PG or MG after an extensive depletion of muscle glycogen and with the provision of exogenous dietary carbohydrate" (Battram. 2004). trial), Battram's results are still no outliers. Rather than that, a follow up study by Pedderson et al. 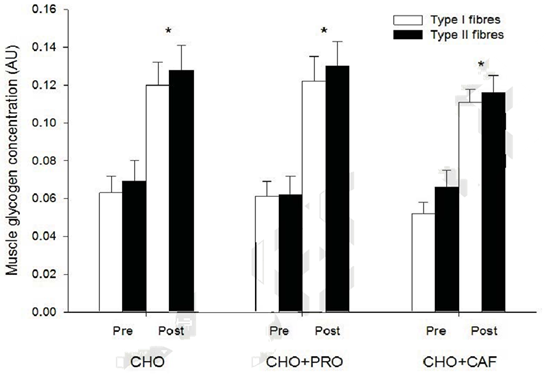 found that, in trained subjects, coingestion of large amounts of Caff (8 mg/kg BM) with CHO has an additive effect on rates of postexercise muscle glycogen accumulation compared with consumption of CHO alone" (Pedderson. 2008). Even though Beelen's study does not support the the superior effect of caffeine on muscle gylcogen, it does at least show that the effect (if it occurs) would probably be identical for fast- and slow-twitch muscles and thus similarly beneficial for strength and endurance athletes (Beelen. 2011). So, there is no doubt that this works? Well, as usual, there is doubt. Another 2011 study by Beelen et al. did not find the same increases in glycogen resynthesis. It is well possible, though that this was due to either the fact that they pumped their subjects up with even higher amounts of carbs, though (1mg/kg/h in Pedderson vs. 1.2mg/kg/h in Beelen) and lower amounts of caffeine (15% less). In view of the fact that the exercise protocol used in the study only halved the glyocogen levels of the subjects, while it was reduced by >75% in the Pedderson study, the lack of effect may also be a result of the lack of full glycogen depletion in Beelen's study (unfortunately, the authors don't provide their values only in arbitrary units - that's why I can't tell you with certainty to which degree this may have influenced the results). at the beginning of the 4 h of passive recovery phase, did not occur at the expense of the restoration of the high energy substrates ATP and PCr (see Figure 2) - since the latter two are especially relevant for people who lift weight, sprint and do other high intensity stuff, there's no reason to believe that the caffeine + sugar post-load was something only endurance athletes could use. Figure 2: High dose caffeine (8mg/kg) increases glycogen resynthesis after exhausting workouts without having ill effects on the resynthesis of ATP and PCr (Pedderson. 2008). Apropos "using" this strategy: Another three years later, Taylor et al. (2011) expanded on the results of Battram (2004) and Pedderson (2008) in a study in which they went beyond testing the mere amount of glycogen that was transported into the muscle and evaluated its effect on the subjects' performance in a post-recovery high-intensity interval-running capacity test. 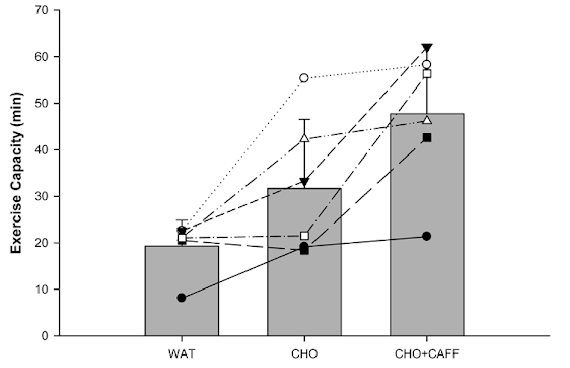 Figure 3: Exercise capacity during the Loughborough Intermittent Shuttle Test for the carbohydrate (CHO), CHO plus caffeine (CHO+CAFF), and water (WAT) trials. Lines represent individual subject responses (Taylor. 2011). As you can easily see in Figure 3, the HIIT advantage, which was tested 4h after the glycogen-depleting exercise protocol and the ingestion of 1.2g/kg carbohydrate +/- 8mg/kg caffeine via an Intermittent Shuttle Test (LIST) to volitional exhaustion, was about as pronounced as the glycogen-advantage Pedderson et al. observed three years before (albeit with some inter-individual differences). 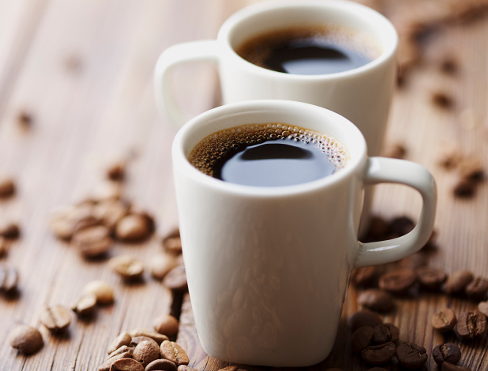 Why would you say caffeine may have a partitioning effect? The answer is easy: While fat cells need insulin to transform and store significant amounts of glucose, muscle cells don't - specifically after workouts the increase in GLUT-4 receptor expression and glucose uptake occurs largely without requiring insulin as a trigger. Now, caffeine's ill effects on blood glucose are due to its ability to block the insulin signalling via beta-adrenergic activity (Thong. 2002). It should thus reduce the glucose uptake by the fat cells while decreasing the rate, but not the total amount of glucose that is taken up and stored by the muscle... speaking of rate and total amount: This hypothesis is fully in line with the initially cited study by Battram et al. who observed just that: a decreased rate, but identical total increase in muscle glycogen. So why haven't we been taking our post-workout caffeine for years, now? Well, I guess the reason is that it is not sure how the effects of caffeine on the sympathetic nervous may effect other factors of the recovery process. In view of the fact the central nervous system will be "on fire" after any workout, though, it is questionable whether adding in 400-800mg caffeine will actually affect its recovery. A better reason for not (yet) subscribing to the post-workout caffeine binges would thus be that (a) few of us actually need to refill their glycogen stores in 4-6h after a workout and that we (b) have no real clue what the mechanism is. If it was actually - as some of the data would suggest - a selective inhibition of fat cell glucose uptake (see box on the right), even those of us who don't have to restore their glycogen stores as fast as possible may see beneficial effects on body composition. If, on the other hand, it works by stimulating the intestinal absorption of glucose, only (cf. Van Nieuwenhoven. 2000), the real world implications for the average trainee would be significantly less pronounced | Comment on Facebook! Battram, Danielle S., et al. "Caffeine ingestion does not impede the resynthesis of proglycogen and macroglycogen after prolonged exercise and carbohydrate supplementation in humans." Journal of Applied Physiology 96.3 (2004): 943-950. Beelen, Milou, et al. "Impact of caffeine and protein on postexercise muscle glycogen synthesis." Med Sci Sports Exerc 44.4 (2012): 692-700. Pedersen, David J., et al. "High rates of muscle glycogen resynthesis after exhaustive exercise when carbohydrate is coingested with caffeine." Journal of Applied Physiology 105.1 (2008): 7-13. Taylor, Conor, et al. "The effect of adding caffeine to postexercise carbohydrate feeding on subsequent high-intensity interval-running capacity compared with carbohydrate alone." International Journal of Sport Nutrition andExercise Metabolism 21.5 (2011): 410. Thong, Farah SL, and Terry E. Graham. "Caffeine-induced impairment of glucose tolerance is abolished by β-adrenergic receptor blockade in humans." Journal of applied physiology 92.6 (2002): 2347-2352. Van Nieuwenhoven, M. A., R-JM Brummer, and F. Brouns. "Gastrointestinal function during exercise: comparison of water, sports drink, and sports drink with caffeine." 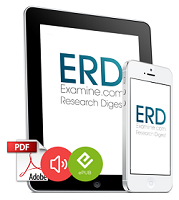 Journal of applied physiology 89.3 (2000): 1079-1085.